I'll admit, my eye shadow collection is not exciting color wise. I'm a neutrals girl and so you'll find almost every palette or quad that I have are to be neutral shades. To answer your thoughts if this DARE came up in your mind, NO not all the shades are the SAME! Least the name of the shadow says so, LOL. One palette that I have which is uber pretty and colorful is my Sigma Beauty Creme de Couture palette and now my Sigma palette will no longer be the loner in my collection. 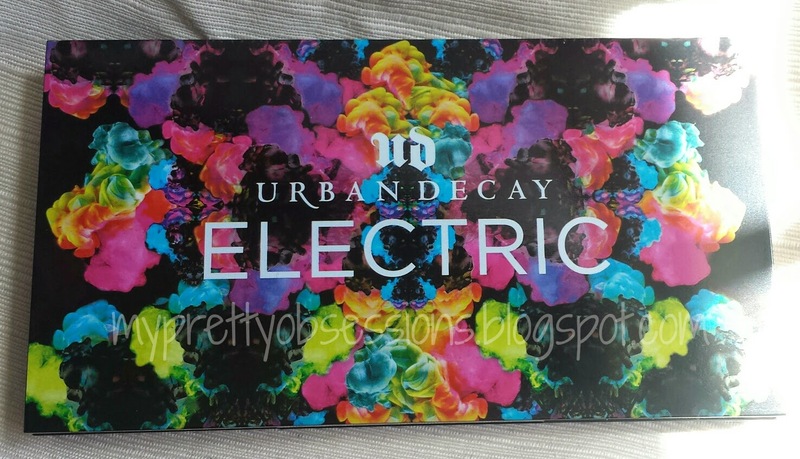 Urban Decay's Electric palette has got my Sigma palette's back! A bright collection of 10 velvety, pressed-pigment shadows that deliver an insane color payout. The ultimate fix for color addicts, this palette features smooth mattes and highly-dimensional shimmery shades. Each soft, creamy, long-wearing powder is electrically colorful, and carefully crafted with a smooth formula that applies vibrantly. Pressed pigments create heavily saturated bright shades that make eyelids pop. The oversize palette features an extra-large mirror and double-sided precision brush for easy application on the go." 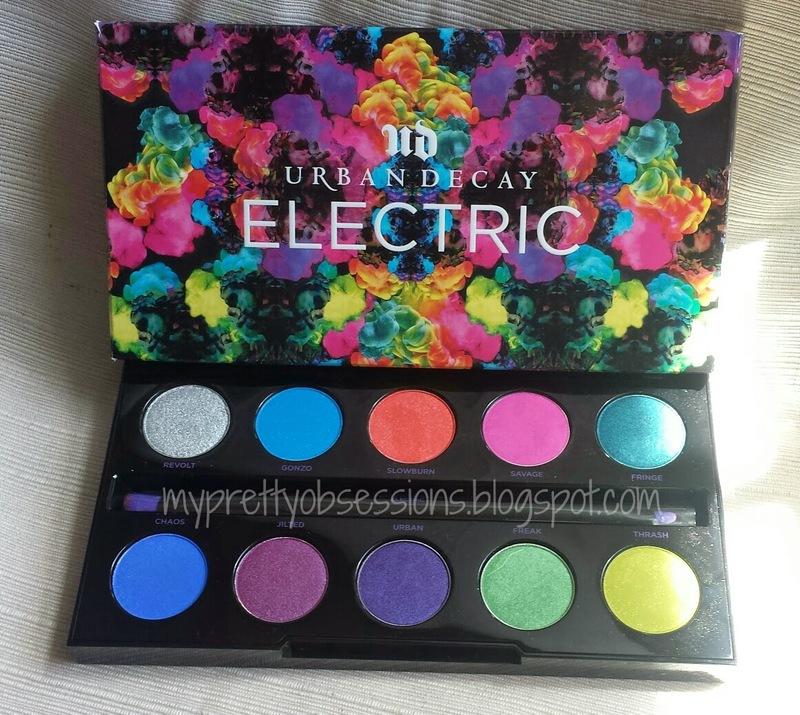 The Electric Palette is a nice sleek palette with cool graphics on the cover. This palette comes in a nice sturdy plastic case with a magnetic closure. Within the palette is also a really big mirror (I covered up in the picture so you won't see me lol) which I like very much especially for travel. There is also a duo sided synthetic brush that's included as well. I am pleased with the packaging as it is nice and sturdy. There are five matte and five metallic pressed pigments. The matte pressed pigments are ultra smooth whereas I felt the metallic pressed pigments a tad bit gritty but all the colors are gorgeous and applies beautifully nonetheless. The matte shadows are Gonzo, Slowburn, Savage, Chaos, and Thrash. The metallic shadows are Revolt, Fringe, Jilted, Urban, and Freak. I swatched these without using a shadow primer. As you can see, the colors swatched on my arm is exactly what you see from the palette! Aren't they just gorgeous? This is a warning label. 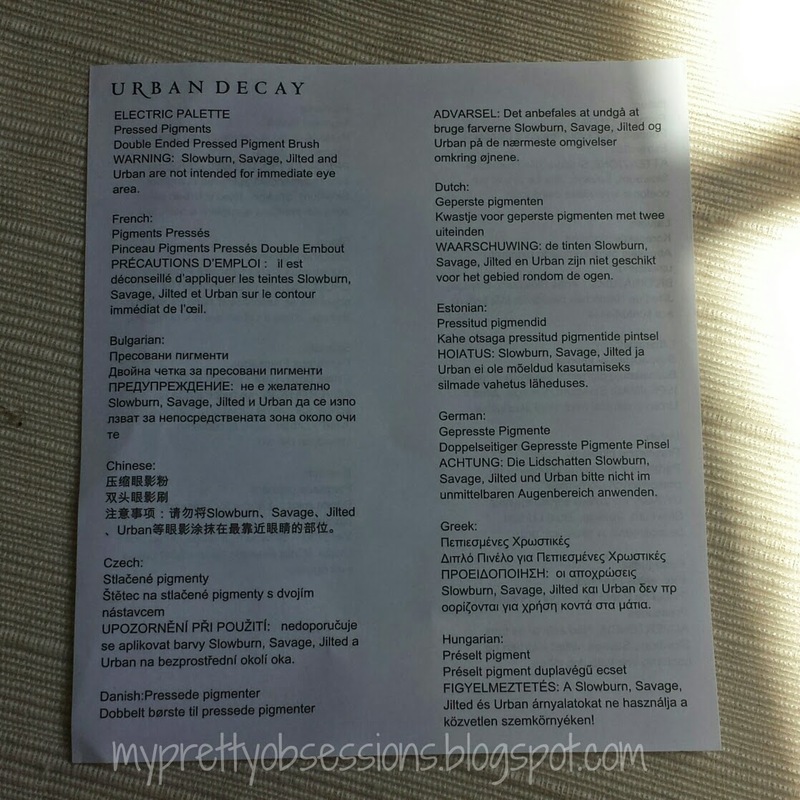 The label says the shades Slowburn, Savage, Jilted and Urban are not to be used on your immediate eye area. How I personally interpreted this warning is to not use the shadows mentioned directly on my lids but rather use them as transition colors/blending colors. That's just me though, let me know how you interpreted this warning if you have this palette! This palette retails for $49 (U.S.D. before tax). Hands down, no doubt yes I believe that this palette is very well worth the money! If you don't know by now, I am a huge makeup palette junkie! I find makeup palettes very well worth the money given it's retail value. For ten gorgeous eye shadows with endless possibilities, I definitely am loving it and have no regrets dishing out the money for it! 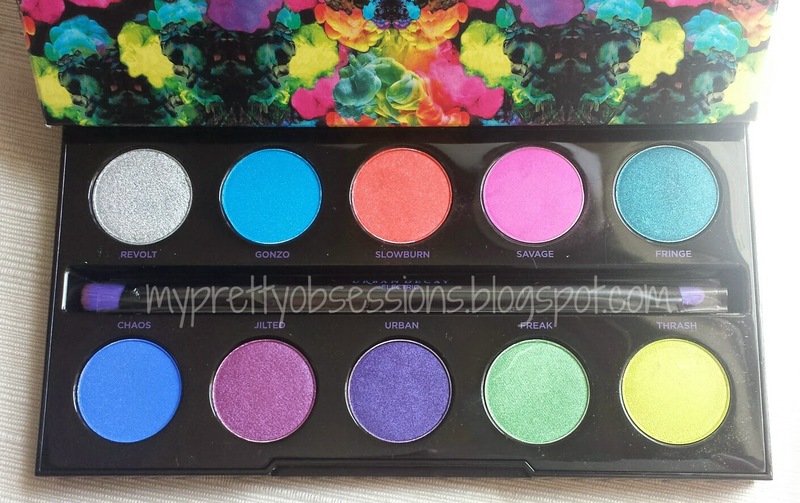 If you were having second thoughts about this palette, don't! Give it a try and swatch them to see how they are to your liking.